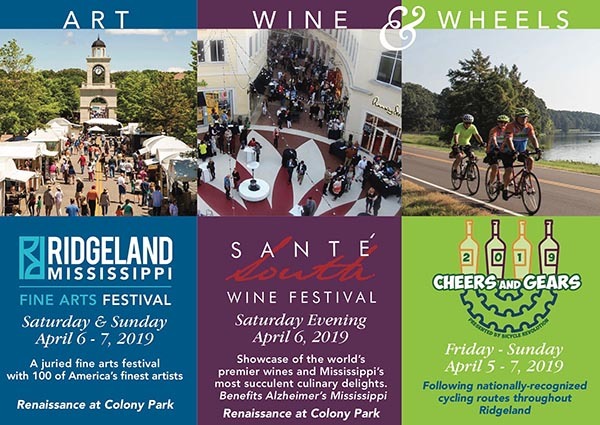 It’s springtime’s big event in Ridgeland on April 5, 6 & 7, 2019 with the annual Art Wine & Wheels Weekend. Over the last eleven years, this exciting weekend in Ridgeland has grown to include fine arts and wine festivals with live music and great food, a 5K race, and a bicycle ride that brings in thousands of folks from all over the U.S. and the world. All the fun takes place at the beautiful Renaissance at Colony Park. Some of America’s most talented artists converge on Ridgeland for this juried art festival that includes clay, drawing/pastels, fiber, glass, jewelry, mixed media 2D and 3D, painting, photography, printmaking, sculpture and wood. The free event provides art enthusiasts and shoppers the opportunity to interact with the artists personally. For a complete list of participating artists, visit RidgelandArtsFest.com. Festival activities include live music on two stages featuring some of the most popular local and regional musicians. Blues great Jesse Robinson will be performing on the East Stage at 11:30 a.m. on Saturday. Bluegrass lovers will enjoy the Delta Mountain Boys performance at 3:00 p.m. on Saturday at the East Stage. At 4:45 p.m. on Saturday at the East Stage, don’t miss the Epic Funk Brass Band who infuse funk, pop, jazz and Go-Go into a custom-made enhancement of second-line brass band tradition. Sunday’s entertainment line-up includes the Ralphael Semmes Jazz Ensemble at 3:30 on the East Stage among others. Visit RidgelandArtsFest.com to find out who’s playing when. Artisans from the Craftsmen’s Guild of Mississippi will be on hand demonstrating their various crafts and they’ll be on hand at the Children’s Creative Craft Corner to help your budding artist create their own “make and take” piece of art. You also don’t want to miss stopping by the Student Art Gallery featuring area high school student’s masterpieces. You will surely be impressed by the amount of talent found in our area schools. Festival attendees can enjoy sampling some unique wines and beer while shopping at the Sante South Sampling Palate. Guests 21 and older can purchase for $20 a punch card at the Information Tents located throughout the festival grounds and take it to the Sampling Kiosk for some fabulous adult beverages. Food trucks will also be at the festival offering some good eats for everyone. Merchants at Renaissance at Colony Park will have ongoing weekend specials during the festival. As you can see, there is truly something for everyone at the Ridgeland Fine Arts Festival! Sante South has grown into the largest wine and culinary extravaganza in Mississippi with over 120 exceptional wines and fine food samplings from more than 20 of Mississippi’s top restaurants. It’s an international showcase of the world’s best wines where boutique vintners present their annual new releases. Visit Sante South for more information and to purchase tickets. Join our friends with Bicycle Revolution for a fun-filled weekend of cycling events that highlight Ridgeland’s nationally-recognized cycling routes. Explore the beautiful Barnett Reservoir, Natchez Trace Parkway and the Petrified Forest on two wheels. For registration and more info, visit Cheers and Gears. Fleet Feet Sports’ Run Now Wine Later 5K is the only race in the area where runners get to enjoy a wine and cheese social at the finish line. The race begins and ends near the Ridgeland Visitor Center located in suite 6006 at Renaissance at Colony Park. Register today at Run Now Wine Later 5K. Art Wine & Wheels…an exciting combination! Book for hotel room now for this exquisite weekend in Ridgeland. We’re excited for you to celebrate springtime with us!